Work on the chrome plugin continues. There are 2 parts to the plugin that are being worked on. Ability to open article insights in an embedded editor so that you can view research, topics etc. Part of the new plugin that makes it so exciting is that Article Insights will suggest the 25 most important terms right inside the editor you are using inline. 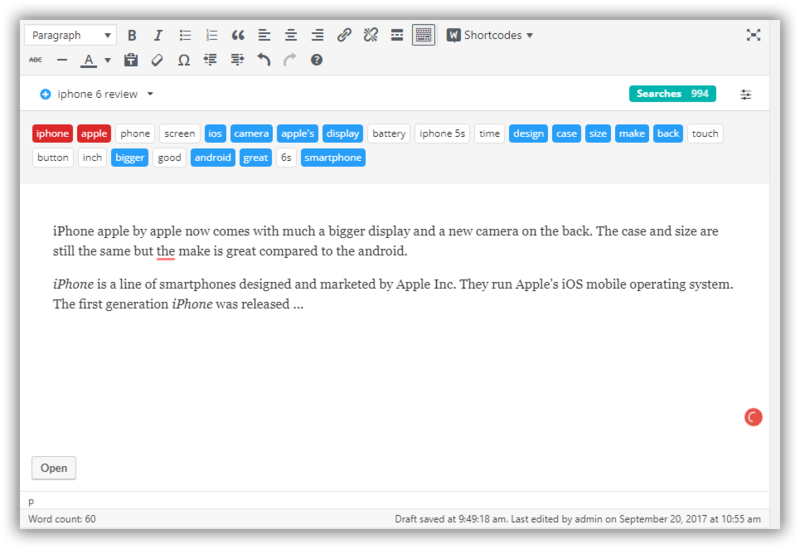 Compared to the previous screenshots, now we have a new purpose-built streamline UI for showing article terms within your WordPress editor. Note that Article Insights is showing you article terms information inside your site, inside your WordPress site post editor. There is no need to switch between Article Insights and your site, its all one screen. Article Insights content embedded inside WP editor. As you type, the words will change color depending on their word usage density. Overused words are in red, blue is ok and red is warning. You can even switch keyword targeting mid way. Finally, just added is the ability for this entire UI widget to resize itself. So the size of the widget will grow bigger or smaller as required. This makes the widget seem like a natural part of the page you are on, when instead it is actually an embedded iframe pointing itself to the article insights app. The ability to add new keywords directly inside this widget, that’s what the “plus” button is for. You can add a new analysis keyword inside the widget without having to leave your text editor. 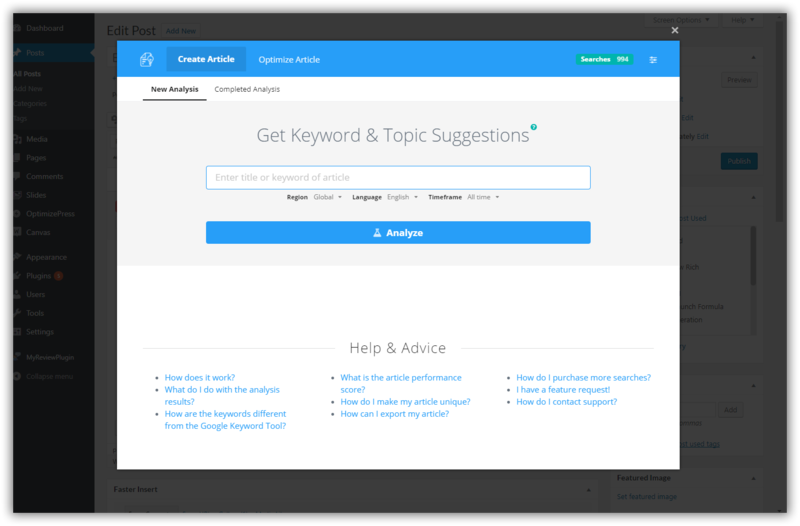 You can even add a new keyword and while the analysis is happening in the background continue writing your article. Unfortunately, it would not be possible to show all the awesome stuff that Article Insights can do with just that small 150px high inline widget. In the background, you can see a WordPress editor, as the Article Insights app opens on top of it. 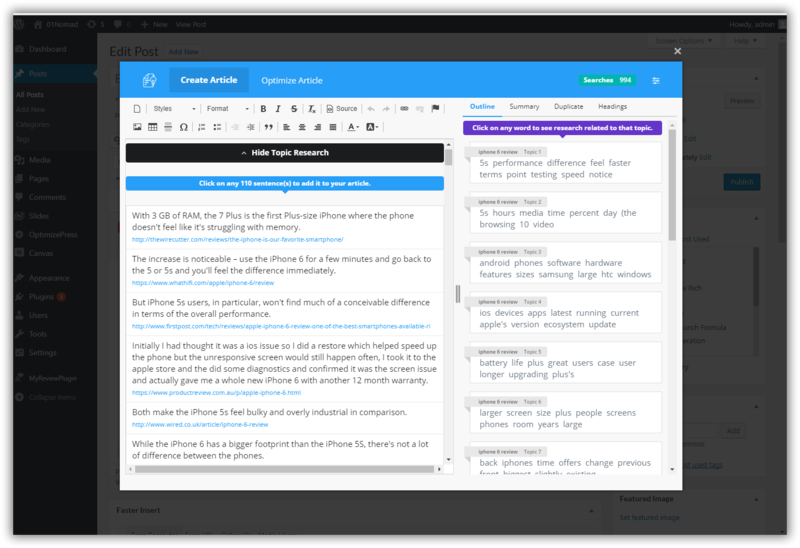 The vision is for you to write your article and call up topic and sentence research at any time without leaving your text editor. Article Insights works where you do! Coming Soon! Article Insights editor popup. Grab all the research you need, there will be an option for you then to paste the research into your editor. This feature is still WIP.